Russia's Alexander Legkov takes gold in a thrilling sprint finish in the men's cross-country 50km race on the final day of the 2014 Winter Olympics in Sochi. Legkov took gold by just 0.7 seconds as he finished ahead of compatriots Maxim Vylegzhanin and Ilia Chernousov, ensuring a clean sweep for the hosts. 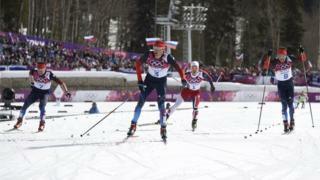 Legkov's margin of victory was the second narrowest ever in the Olympic 50km race, and the result moved Russia to the top of the medal table.